My personal focus for quite some time has been the lack of viewpoint diversity on scientific issues — HIV/AIDS, global warming, and a host of less prominent topics (see Dogmatism in Science and Medicine: How Dominant Theories Monopolize Research and Stifle the Search for Truth). But earlier I had been appalled — and still am — over political correctness, by which I mean the dogmatic assertion that certain sociopolitical views must not only prevail but must be enforced, including by government action. NAS is concerned with many issues, including academic content, cost, unfairness, academic integrity, campus culture, attitudes, governance, and long-term trends. We encourage commitment to high intellectual standards, individual merit, institutional integrity, good governance, and sound public policy. What that involves in practice is illustrated in the newsletter I edited until my retirement. Common to NAS, the Heterodox Academy, and dissenting from dogmatism on HIV/AIDS, global warming, and many other issues is the belief that views and actions ought to be consonant with and indeed formed by the available evidence and logical inferences from it — by the truth, in other words, at least as close as humans can come to it at any given time. Ideologies and worldviews can make it difficult for us even to acknowledge what the evidence is when it seems incompatible with our beliefs. Since my interest for many decades has been in unorthodoxies, I’ve looked into the evidence pertaining to a greater number of controversial issues, in more detail and depth, than most people have had occasion to, with the frustrating consequence that nowadays many of the people with whom I share the preponderance of sociopolitical preferences are not with me regarding HIV/AIDS or global warming; I’m the rare example of “A politically liberal global-warming skeptic”; and I wish that those who seem to agree with me did not include people whose sociopolitical views and actions are abhorrent to me (say, Ted Cruz or Jeff Sessions). At any rate, in science and in the humanities and in politics, in all aspects of human life, the thing to aim for is to find the best evidence and to be guided by it. 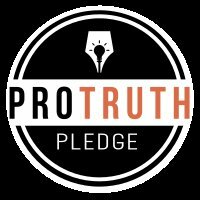 Through the Heterodox Academy I learned recently of the Pro-Truth Pledge; see “How to address the epidemic of lies in politics: The ‘Pro-Truth Pledge,’ based on behavioral science research, could be part of the answer”. The badge of that pledge is now on my personal website, and I encourage others to join this venture. I don’t expect quick results, of course, but “The journey of a thousand miles begins with one step” (often misattributed to Chairman Mao, but traceable more than a millennium further back to Lao Tzu or Laozi, founder of Taoism).